They're here!! My new business cards have arrived and I'm so happy with them. I was running out of my old cards, plus I wanted to combine the business cards for my blog with the cards I use for my book. Now, I have one card with all of my information and it's great. This is my desk at work - notice the Georgia Tech Ramblin' Wreck :) and now I have a few cards on my desk to share with anyone who wants one. I loved the pink and blue combination with the white font. And I used a photo from the mini-photo shoot I had with a friend at work. Out with the old (on the bottom) and in with the new (on top). I ordered 150 cards and Minted even sent this cute little card holder so they can stay clean and organized in my bag. 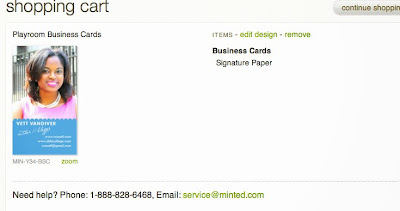 Ordering them online from Minted was super easy and the customization options are really fun! Do you have business cards for your blog and/or business? Ohh, I love this and will check them out. I just came from my first blog conference and had homemade cars but I'm looking into more professional ones. Business card is a great idea to promote your blog. I've been thinking a lot about getting business cards lately but still haven't taken the leap, do you hand out many? Love Minted, and your cards look great!! These came out so great, what an awesome way to promote yourself! Vett, I LOVE your business cards. I think these are very classy! I am ordering mines today! Super cute cards, I love them!